Copyright 2019 by Sustainable Ocean Alliance. All rights reserved. The World Economic Forum sets the agenda for the rest of the year, and often has a lot of competing issues fighting for attention. In this midst, Sustainable Ocean Alliance (SOA) launches its inaugural State of Our Ocean Annual Report. Those in the most vulnerable positions, such as small island states or poorer coastal regions have been noticing this change for years. It is now time to take action to reverse this decline. 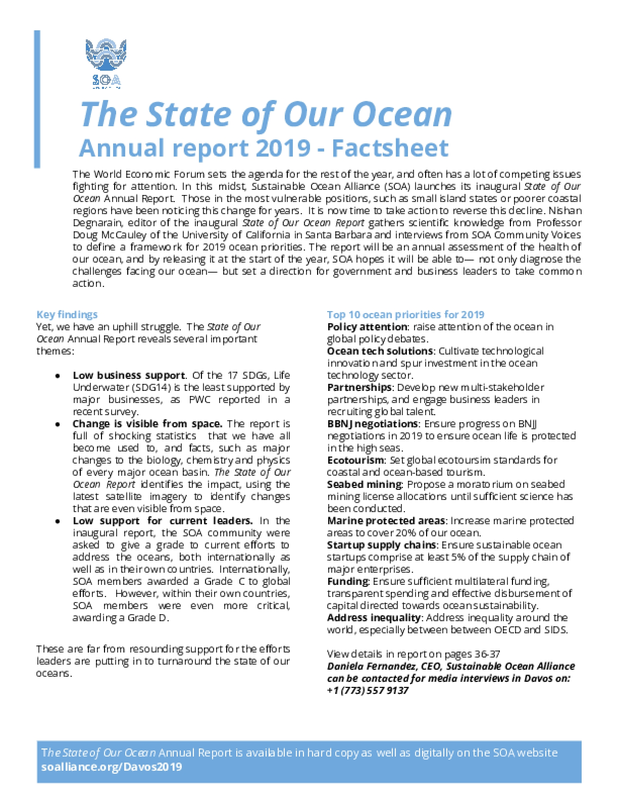 Nishan Degnarain, editor of the inaugural State of Our Ocean Report gathers scientific knowledge from Professor Doug McCauley of the University of California in Santa Barbara and interviews from SOA Community Voices to define a framework for 2019 ocean priorities. The report will be an annual assessment of the health of our ocean, and by releasing it at the start of the year, SOA hopes it will be able to— not only diagnose the challenges facing our ocean— but set a direction for government and business leaders to take common action.